Since we have two house dogs, one male shih-tzu and one shih-tzu and Japanese Spitz mix breed, I am in search of affordable dog beds. I browse some online shops and pet stores around our area and I find these to be quite expensive. Considering that I have to buy two for our two dogs, that's quite a big amount of money to be spared from our monthly budget. I've seen the sample dog beds on pet shops and through online stores and I found that this is nothing short of a plastic basket or tray with soft and pretty cushion on it. So I told myself, why don't I just make one for our lovely pets. So my frugal instinct led me to a thrift store and buy some cheap plastic trays. We have extra foam sheets at home and cut it to a desired size. After that, I made use of old pillow cases to cover the foam. Thereafter, I bought some nicely printed foot rugs to be placed on top of the foam sheets and placed these inside the plastic tray. 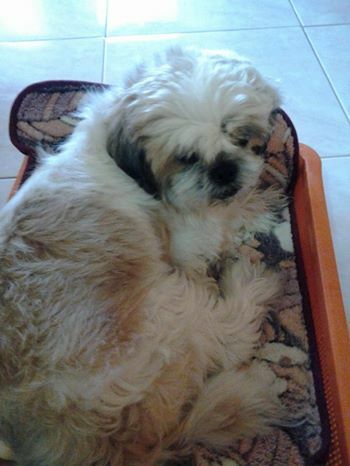 My shih-tzu pet loved it just the same and I was so pleased on how easy it is for me to train him to use his new made bed. :) I would just say "go to bed" and point to the DIY bed and he would immediately follow my instruction and position himself inside the plastic tray turned bed.